What kind of sauced up swine doesn’t like a pint with his ribs? Not me. 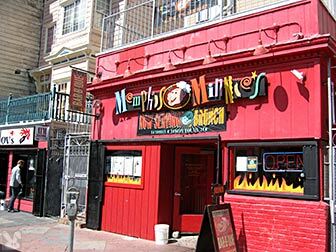 When I want maximum flavor I head to Minnies. Order at the counter, pay and have a seat. They call you when your order’s ready. The food comes out pretty quick since most of it has been sitting over smoldering embers waiting to be plated. Seriously yummy beef ribs. Meaty, flavorful and cooked to perfection. 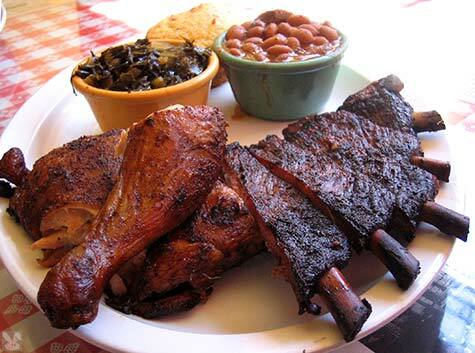 Gnawing on these big bones bring out your inner caveman. 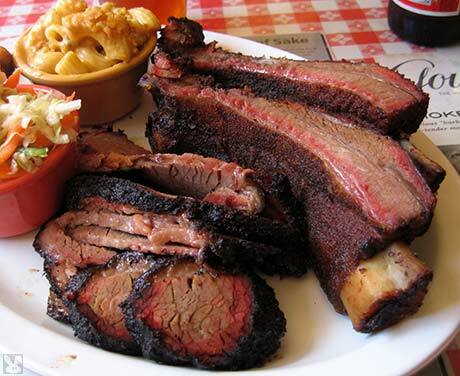 The brisket is smoked for 18 hours and the resulting tender meat is best bathed in some of their housemade sauce. 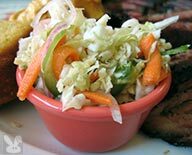 The coleslaw was a crisp and tangy combo of cabbage, carrots, peppers, onion with just the right amount of white wine vinegar to give a little pucker at the end. 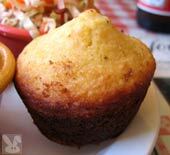 The combo plates also come with one of their hot-from-the-oven, muffin shaped, cornbreads to guild the lily. This little plump, yellow, dough gob reminded me that you are what you eat. 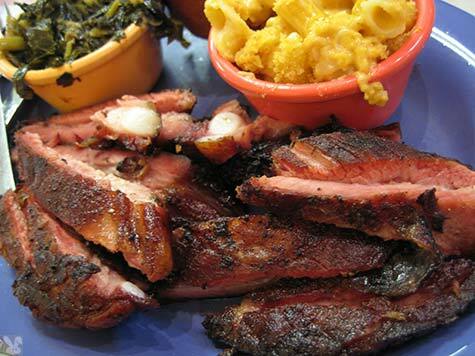 The down side of the excellent beef ribs is that these perfectly tasty pork ribs have a hard act to follow. 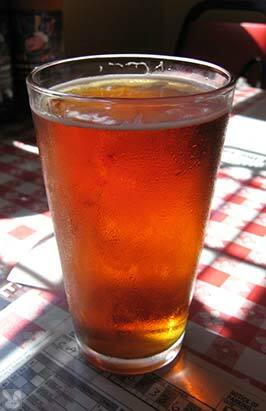 Nicely spiced and smoky with a squirt of one of the three varieties of sauce, these go down well with a cold beer. The smoked chicken comes bronzed and perfectly cooked in it’s spice rub. The potlikker greens are cooked until tender and chopped into small chunks. They are addictive in their astringent, vinegar enhanced, vegetal deliciousness. The pit smoked beans were cooked to the perfect al dente with savory flavoring chunks of pork and just a kiss of sweetness for depth of flavor. One of the cheapest and yummiest things on the menu. Porky ribs, no bones. Vinegar and hot sauces came into play with this meaty dish. 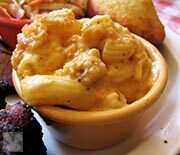 I chose mac and cheese and potlikker greens as my sides with this bargain chow. They serve Anchor on tap which is a great compliment to these smoky treats. I was surprised to see that they also carry a variety of premium sakes. Next time I’ll have to order one to see how it combines with the strong meat flavors. If you don’t feel like a big platter of ‘que, you can come in for one of their meaty sandwiches, or their weekend brunch. They also sell their meats by the pound if you would rather eat messily in the privacy of your own home. As good as it is, Memphis Minnies can be a little inconsistant. Although more the exception than the rule, gristley meat, unremarkable sides and tired cornbread have sometimes passed over my plate. 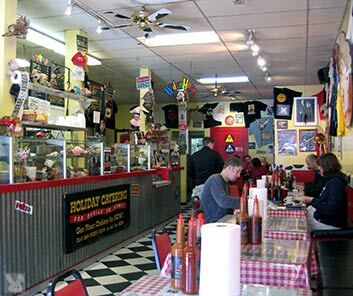 But for a usually delicious carnivore experience, it’s a great place to keep in the ‘que. One not so Fabio-less thing is that they are users of I Can’t Believe It’s Not Butter. But if you can’t either, then I guess it really doesn’t make a difference, right?